The Test Explorer view enables the visual execution and debugging of PHPUnit tests. The tests are executed by the PHPUnit and the results are displayed in the Test View, as shown in the next figure. The PHPUnit output is shown in the PHP (PHPUnit) output tab. It is necessary to configure the system before the tests can be executed. The process requires PHP, the PHPUnit phar file and a configuration file. Internally, PHP Tools resolves the tests by executing php -d display_errors=on PHPUnit.phar --teamcity in the workspace root directory. This command relies on the phpunit.xml to be present in the root. The configuration file must identify all the desired tests and provide all the settings to PHPUnit. The command specified by the php.executablePath value in the user's settings. php on the command line if the setting is not present. The vendor directory, usually created by composer. Built-in PHPUnit phar (version 6.5.12.) distributed with PHP Tools, in case the phar file is not found in the vendor directory. The tests rely on the phpunit.xml configuration file (PHPUnit configuration), which must be placed in the root of the workspace. PHP Tools can generate a basic configuration file, if it locates any tests and the configuration file is missing. If the configuration file is missing and PHP Tools locates any files named *test.php, it will offer to create a basic configuration via pop-up message. The name, location, extension and settings of the tests are defined in the phpunit.xml configuration file. The tests should be located in a sub-directory, not directly in the workspace root, because PHPUnit does not recognize them there. Test Explorer View provides tools for manual and automatic test execution with visual representation of the results. The view is only visible if there are some tests or the phpunit.xml configuration file in the workspace. - The test was executed without errors. - The test was executed with errors; the error message is in the output tab. - The test was executed and skipped (see incomplete-and-skipped-tests). - Test is currently running (this is shown usually during debugging). The actual result of the PHPUnit execution is displayed in the PHP (PHPUnit) output tab, while each test has its own output available by clicking on the test in the Test Explorer View. 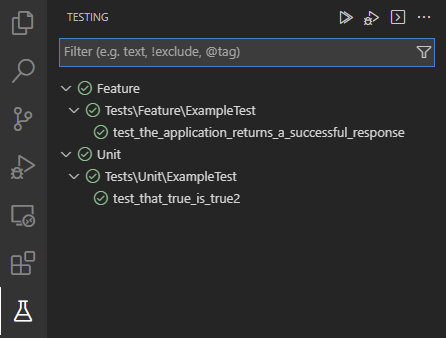 Tests can be debugged with Xdebug by clicking the bug-like icon in the Test Explorer View. Tests can be debugged one at a time, it is not possible to debug all tests at once. The debugging process is the same as standard debugging. Tests can be executed continuously by enabling autorun in the Test Explorer View. Once enabled, tests will be executed every time a tested file is saved after modification.